Keywords: breast cancer, axillary lymph nodes, sentinel lymph node, intraoperative frozen section. BACKGROUND: Breast cancer is commonest malignancy of females all over the world. Modified radical mastectomy is still considered as a standard for treating breast cancers. Axillary lymphadenectomy is achieved at the cost of significant morbidity, with a high acute complication rate and a high chronic lymphedema rate. Sentinel lymph node biopsy is associated with better arm function, better quality of life, a shorter hospital stay, and faster recommencement of daily activities than standard axillary lymph node dissection. There are inconsistencies and controversies regarding the pathological work-up of sentinel lymph nodes and no generally applied guidelines exist. METHODS: In total, 60 breast carcinoma cases were studied over a period of 2 years. The axillary lymph node status was determined intra-operatively in carcinoma breast by frozen section assessment of sentinel lymph node. RESULTS: Intraoperative frozen section had sensitivity of 90.3%, specificity of 100%, positive predictive value of 100%, negative predictive value of 90.6% and diagnostic accuracy of 95%. The sentinel lymph node biopsy had a false negative rate of 13.3%. 16.1% cases showed only sentinel lymph node positivity with non-sentinel lymph nodes free from metastasis. 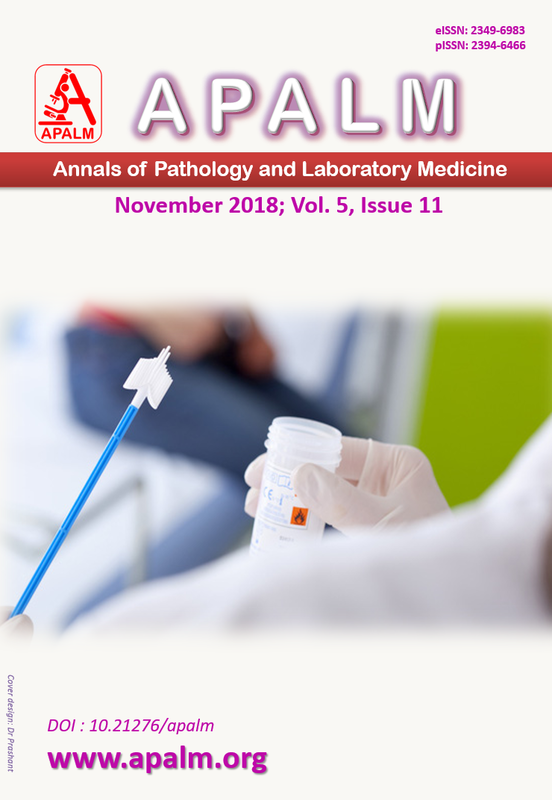 The positivity of sentinel lymph node for metastasis was dependent upon certain characteristics of patients such as tumour size, tumour location and grade of tumour and was independent of patient’s age. CONCLUSION: Intraoperative frozen section evaluation of sentinel lymph node (SLN) to predict the status of non-SLN can be recommended only in selected patients in early stage of disease. Professor and Head, Pathology Department. 1. Arafah M. Correlation of hormone receptors with her 2/neu protein expression and the histological grade in invasive breast cancers in a cohort of Saudi Arabia. TJPATH. 2010;26(3):209. 2. D'cruz A. Standard treatment guidelines oncology [Internet]. 2018 [cited 1 November 2015]. Available from: http://clinicalestablishments.nic.in/WriteReadData/329.pdf. 3. Asthana S, Labani P, Labani S. A review on cancer incidence in India from 25 population-based cancer registries. J NTR Univ Health Sci. 2015;4:150. 4. Mansel R, Fallowfield L, Kissin M, Goyal A, Newcombe R, Dixon J et al. Randomized multicenter trial of sentinel node biopsy versus standard axillary treatment in operable breast cancer: the ALMANAC trial. JNCI. 2006;98:599-609. 5. Samphao S, Eremin J, El-Sheemy M, Eremin O. Management of the axilla in women with breast cancer: current clinical practice and a new selective targeted approach. Annals of surgical oncology. 2008;15(5):1282-96. 6. Larson D, Weinstein M, Goldberg I, Silver B, Recht A, Cady B et al. Edema of the arm as a function of the extent of axillary surgery in patients with stage I–II carcinoma of the breast treated with primary radiotherapy. Int J Radiat Oncol Biol Phys. 1986;12(9):1575-82. 7. Ivens D, Hoe AL, Podd TJ, Hamilton CR, Taylor I, Royle GT. Assessment of morbidity from complete axillary dissection. Br J Cancer. 1992;66(1):136-8. 8. Keramopoulos A, Tsionou C, Minaretzis D, Michalas S, Aravantinos D. Arm morbidity following treatment of breast cancer with total axillary dissection: a multivariated approach. Oncology. 1993;50(6):445-9. 9. Senkus E, Kyriakides S, Ohno S, Penault-Llorca F, Poortmans P, Rutgers E et al. Primary breast cancer: ESMO Clinical Practice Guidelines for diagnosis, treatment and follow-up. Ann Oncol. 2015;26 (5):v8-v30. 10. Lyman GH, Somerfield MR, Bosserman LD, Perkins CL, Weaver DL, Giuliano AE. Sentinel lymph node biopsy for patients with early-stage breast cancer: American Society for Clinical Oncology clinical practice guideline update. J Clin Oncol. 2017;35:561-4. 11. Mitchell ML. Frozen section diagnosis for axillary sentinel lymph nodes: the first six years. Mod Pathol. 2005;18:58-61. 12. Gipponi M, Bassetti C, Canavese G, Catturich A, Di Somma C, Vecchio C et al. Sentinel lymph node as a new marker for therapeutic planning in breast cancer patients. J Surg Oncol. 2004;85(3):102-111. 13. Tille J, Egger J, Devillaz M, Vlastos G, Pelte F. Frozen section in axillary sentinel lymph nodes for diagnosis of breast cancer micrometastasis. Anticancer Res. 2009;29(11):4711-16. 14. Friedman D, Gipponi M, Murelli F, Meszaros P, Solari N, Massa M et al. Predictive factors of non-sentinel lymph node involvement in patients with invasive breast cancer and sentinel node micrometastases. Anticancer Res. 2013;33:4509-14. 15. Koyama Y, Ichikawa H, Sakata J, Sakata E, Tatsuda K, Hasegawa M et al. The association between sentinel lymph node metastasis and Ki-67 labeling index. Adv Breast Cancer Res. 2013;02:60-65. 16. Gajdos C, Tartter P, Bleiweiss I. Lymphatic invasion, tumor size, and age are independent predictors of axillary lymph node metastases in women with T1 breast cancers. Ann Surg. 1999;230(5):692-6. 17. Viale G, Zurrida S, Maiorano E, Mazzarol G, Pruneri G, Paganelli G et al. Predicting the status of axillary sentinel lymph nodes in 4351 patients with invasive breast carcinoma treated in a single institution. Cancer. 2005;103:492-500. 18. Fein D, Fowble B, Hanlon A, Hooks M, Hoffman J, Sigurdson E et al. Identification of women with T1-T2 breast cancer at low risk of positive axillary nodes. J Surg Oncol. 1997;65:34-39. 19. Rivadeneira D, Simmons R, Christos P, Hanna K, Daly J, Osborne M. Predictive factors associated with axillary lymph node metastases in T1a and T1b breast carcinomas: analysis in more than 900 patients. J Am Coll of Surg. 2000;191:1-6. 20. Olivotto I, Jackson J, Mates D, Andersen S, Davidson W, Bryce C et al. Prediction of axillary lymph node involvement of women with invasive breast carcinoma: a multivariate analysis. Cancer. 1998;83:948-955.